With denim, all too often we fall prey to a false belief that what you see is what you get—that a jacket, pair of jeans, vest, or other item constructed from denim isn’t fixable or alterable when something bad happens to it. After all, you can’t sew up a tear in denim the way you can in a gentler fabric like cotton or wool, can you? Well, maybe not, but there are other ways to manipulate your denim at home with impressive results. Keep scrolling for seven denim hacks that will make your life so much better in a flash! Cuffing your jeans at the hem might seem like a pretty straightforward task—but in fact, according to denimwear blog Jack Threads, there are no less than six ways to roll your jeans. Each one has a totally different overall impact on your outfit, so get creative and feel free to have fun with your cuffs! We’d be willing to bet that at some point in your life, you’ve tried on a pair of pants that fit on the bum but were a bit too big at the waist, producing what we’ll dub the Infamous Waist Gap. This hack’s a bit more advanced—it requires either a skilled sewing hand or a machine—but we have to admit, it’s pretty genius. If you’re experiencing the IWG, take a strip of elastic about six inches in length, then sew it using navy-coloured thread (or whatever colour matches your jeans) into the back part of your waistband. Sew it using a zig-zag stitch, so the denim slightly gathers and tightens a bit. When you put the jeans on again—voila! No more gaps. If you do choose to wash your denim, there’s nothing worse than putting on a pair you formerly loved to find that they’ve magically shrunk two sizes in one wash. Make sure this never happens in three simple steps: Wash them in cold water only, dry them on medium heat for just 10 minutes, then air dry them the rest of the way. Voila! 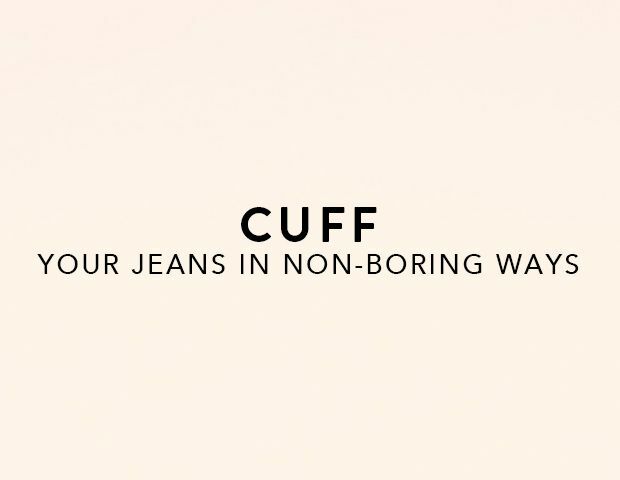 Your jeans will never shrink again—we promise. We’ve all been there—the zipper handle comes unhooked from the teeth and renders your zipper totally useless. There’s a relatively simple way to fix this, detailed over on DIY blog Make It or Fix it, that involves cutting the zipper between two teeth, rethreading the zipper handle, and sewing up your cut to create a temporary stop for the zipper before you take it to a tailor to replace it. It sounds complex, but is actually pretty novice in the sewing department. You might think if the button falls off your favourite jeans that it’s time to lay them to rest and call it a day—but not so! All you need to replace a button that has fallen off: a new button (duh) and this handy- dandy little button snap. DIY blogger The Frugal Girl has a great guide on how to use the tool to add a new button to your jeans in, well, a snap! If you look down one day to discover a freshly minted rip in your jeans, there’s a simple way to turn an accident into a style statement—just keep ripping them. Check out our handy guide on how to distress your own jeans, gather your supplies, and have a field day. This is the denim equivalent of making lemonade out of lemons, we’d say. As you might already know, washing jeans is so 1995. Many denim aficionados claim that washing jeans has more potential to ruin them than to help them look fresh and new. Instead, try this trick when your jeans start to feel icky: Fold them, place them in a large Ziploc bag, and tuck them into your freezer for a few days. Any bacteria that may have been living on your pants from normal wear will be killed in the process, leaving your jeans feeling fresh, crisp, and (yes) clean.